How’s this for a great shot from the early ’70s? This postcard is from Reno Tahoe Specialty, Inc.
Nate Jacobson built the King’s Castle Casino at Incline Village (Lake Tahoe), Nevada after selling his part of Caesars Palace in 1969. A former insurance salesman, broker, and owner, Jacobson faced charges from the Securities and Exchange Commission relating to the sale of Caesars Palace in 1969. His club at the lake ran into issues soon after taking a Teamsters loan to build the property, and they continued as the small casino struggled to get a foothold in a resort community that especially in the early 1970s was quite seasonal. When the snow flew, so did most of the tourists. Sure, there were skiers at Incline, but historically at both north and south shores of Lake Tahoe, the skiers were there to ski, not gamble. Jacobson moved to the Lake from Las Vegas in 1968 after selling his Baltimore Bullets NBA basketball team, turning his insurance agency over to his sons, and leaving his job as President and CDO of Desert Palace, Inc. (Caesars Palace). What Jacobson built at Incline Village was complete with medieval castle motif including walls, turrets and an indoor dinner theater named Camelot. Outside, the grounds held a full-size Lady Godiva on a horse and four palace guards. Unfortunately, real guards inside the casino were not as trustworthy as they might have been. One problem leading to the casino’s closure in 1972 was a general lack of honesty. Workers in several areas of the club were stealing from inside. Two security guards even had keys to the drop boxes from the blackjack tables. When the boxes went to the soft-count room in an elevator, the guards would help themselves to a few hundred dollars each night. They got caught because one of them accidentally took a “fill-slip” along with his nightly cut. When the club closed, 500 workers lost their jobs. The chips from the club went into the hands of several managers, one of whom was supposed to dump them in the lake. He didn’t make it there with all the chips, which is nice for collectors. The club reopened in 1974 and lasted less than a year under Judd McIntosh. Later, Jimmie Hume took charge of managing the club for a year or so until it was purchased by Hyatt Hotels in May of 1975. Hyatt brought in Jack Hardy as general manager, and he oversaw the renovation and reopening of the property, and since that time, the club has been successfully run as the Hyatt Regency at Incline-Village. Bill Harrah was already a successful casino operator in Reno when he expanded to Lake Tahoe. The expansion is a little confusing, because, over the years, the Harrah’s name graced both sides of Highway 50 at Stateline. Hopping from spot to spot was a pattern Harrah had used in Reno, where he first set up shop at 124 N. Center Street, opening his first Nevada business on October 29, 1937, at the Owl Club. It wasn’t successful, but that didn’t stop him from opening another club the following summer. Over the next six years, Harrah had a half-dozen clubs, finally settling on Harrah’s Reno Club in 1945. At Lake Tahoe, Harrah first purchased George Cannon’s Gateway Club, which was housed in an old Quonset Hut. It was located on the lakeside of the highway. It was upgraded to Harrah’s high standards and reopened for the 1955 summer crowd. The club included the original South Shore Room plus keno, roulette, craps and 21 and a parimutuel wheel (Big 8) and of course, plenty of slot machines. Players had a choice of two bars, a snack bar, a 24-hour restaurant, and a premium booth, where slot players could redeem their premium points for gifts. Business was very good, and just two years later, Harrah purchased Sahati’s Stateline Country Club across the highway, on the mountain-side, which dated back to the 1930s. 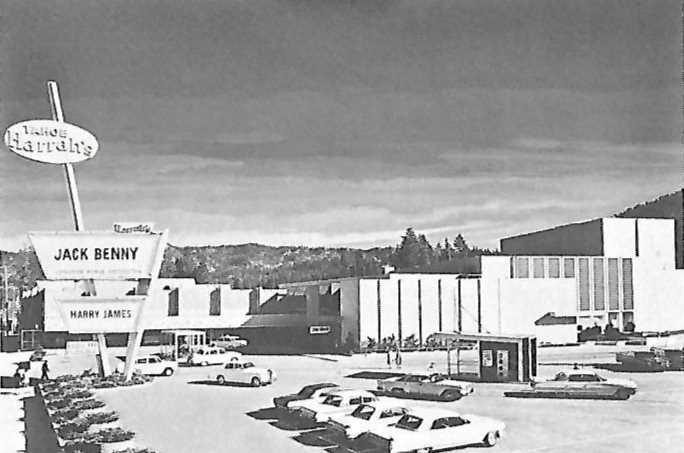 It opened as Harrah’s Tahoe in 1957. A new and vastly expanded South Shore Room theatre-restaurant opened in late 1959. The new club had everything the club across the street had, plus a bingo room and a banquet hall called the Edgewood Room. An underground walkway was added in the 1960s, so players and employees could get across the highway without fighting the crowds of summer, or the snow and bitter cold of winter. Harrah’s Club on the lake-side was eventually sold to Harvey Gross, builder of Harvey’s casino. Forty years later in a strange twist, Harrah’s purchased Harvey’s club and now the parent company owns both, once again. A much more detailed history of Harrah’s clubs in Reno and Lake Tahoe is found in the book, Nevada’s Golden Age of Gambling. Just $3.99 for 180 pages of stories and photos from the good old days! This has always been one of my favorite photos of George’s Gateway Club because it sets the time in casino history so well. The cars show their age, and the simple fact that you could park right next to the building is significant to me. The early ’50s presented a simpler way of life – and gaming too. Inside the club, there was one bar, one restaurant, one craps game, one roulette table, five 21 tables, and less than 100 slot machines. You can probably also see that the building itself is actually a converted Quonset hut. Strangely enough, George Sam Canon, who owned a bar and dance hall in Colfax, California called …(drum roll please) the Quonset Club, decided during the winter of 1948 to dismantle the hut piece by piece, pack it up, and haul it to South Shore Lake Tahoe on a couple flatbed trucks. He and his partners rebuilt the club with those huge signs proclaiming the casino to be George’s, but he actually only held a 50% interest. Nonetheless, George was certainly the boss. By 1950 the club had 60 employees, including several family members like George’s wife Anna and their daughter, Barbara Anne, who according to friend Steve Passalacqua, actually stripped the bark off the wooden log beams used in the rustic dining room with a draw knife. Although under 21, she also made change for slot players, paid jackpots, worked in the cage, and became a dealer when she did turn 21. The Gateway was a summer business, but George Canon tried hard to make Lake Tahoe a year-round resort. When he sold the Gateway to Bill Harrah in 1955, he and his partners started the Heavenly Valley ski resort. After selling his share of the business in 1960, George operated George and Tex’s Gateway club in Jackpot, Nevada until it burned. Afterward, it was rebuilt as Diamond Jim’s. Back at the lake, Bill Harrah also rebuilt, first turning the Gateway into Harrah’s Lake Club before switching sides of the highway with Harvey Gross (Harvey’s Casino) and opening Harrah’s Lake Tahoe – eventually building the high rise hotel in 1973. Lake Tahoe had some of the greatest casinos in Nevada – and they are still going strong! I always thought the photos of the Tahoe Village were cool with it’s rounded shape and lots of windows to watch the snow while you had a beer after your shift. The building had a number of names from its inception in 1945 as the Tahoe Village with Mickey Wood financing. Bert Riddick was one of the casino owners, along with Skoff in 1946 and 1947, Elkins in 1948, and then Babe Arata and Walter Parman took a shot. The club had a small motel next door for its visitors and the casino itself was in that circular area with the bar. The windows actually had a direct view of Lake Tahoe at South Shore. Walter Parman (as mentioned in The Roots of Reno) was busy with Reno clubs, so he gave up his interest as casino manager to Lou Watters, who changed the name to Casino de Paris and brought Parisian entertainment with beautiful cancan girls to the small nightclub. Frank Sinatra appeared at the request of Sammy Sellette, but his performance was flat and he was heckled by the crowd. He was so incensed that he never appeared at the lake again until purchasing an interest in the Cal-Neva Lodge six years later. In 1955, Oliver M. Kahle and his partner, Ben Jaffe, bought the club and changed the name to Oliver’s. Kahle upgraded the motel next door, adding a large pool that also had views of the lake. He tried unsuccessfully to rebuild the casino, which was making money, but there was a fire in 1963 that destroyed much of the building. Unable to rebuild, he sold the land to Douglas County and moved back to Las Vegas where he operated The Castaway’s until Howard Hughes purchased the property. The last time I posted, there was a lot of snow around my car. No more than there was in the picture of the old Christmas Tree casino at Mt. Rose in Reno, but a lot. It’s 107 degrees in Scottsdale, Arizona right now. I’m comfortable. In the picture above, June Abelman is throwing a snowball at Nick Abelman, owner of the small casino and restaurant in the 1940s. Nick was a long-time casino owner in Northern Nevada, having started his career in Goldfield and Tonopah, several hundred miles south. He passed on Las Vegas completely, never interested in the town because it didn’t have gold mines. Abelman’s career as a Nevada Gaming Pioneer is chronicled in The Roots of Reno, which tells the story of Northern Nevada casino owners like Bill Graham, Jim McKay, George Wingfield, how they operated their establishments, and how they changed casino gambling in the state of Nevada. What’s interesting about Nick is that he almost always used a simple handshake to seal his business deals. He often carried $10,000 or more on his person just in case he came across a businessman in need of a quick partner, and once loaned a South Lake Tahoe casino manager $100,000 for the weekend so he could prove to his boss that the club still had plenty of cash to run on. Nick received a 10% fee for the three-day loan. Nice! In the 1940s, when walking from his home on California Ave. in Reno with his nephew, William Pettite, Nick liked to hand $50 bills to the passerby’s he knew to be old friends or gaming customers from his Reno clubs like the Waldorf and Riverside casinos. That’s pretty nice. In the early 1980s, Bill Borland started a small newsletter to feature the casino chips he was selling. I followed suit in 1984 with the National Registry and then continued with Casino and Gaming Chips Magazine in 1986. Archie Black added articles to my offerings and in 1987, he started the Casino Chips and Gaming Token Collectors Club. Early collectors like Phil Jensen, Bruce Landau, myself, and Dale Seymour, we hitting flea markets, antique store and casinos alike to find old and interesting chips. Seymour followed his collecting bug and published the book Antique Gambling Chips. Seymour’s book was followed by Howard and Kregg Herz’s work, A Collectors Guide to Nevada Gaming Checks and Chips. As the curator for Harvey’s Wagon Wheel at Lake Tahoe, Herz established the largest collection of individual casino chips in the world and found a niche for his efforts in the book penned by he and his wife. About the same time, Allan Myers, Ernest Wheelden, and Michael Knapp put out a price guide to the casino chips and checks of Nevada. Their work was titled The Chip Rack and included hundreds of pages of chip varieties, casino starting dates, and a value code for known chips. The book is routinely updated to keep up with an ever-expanding line of casino chips and new finds. Individual chips are made by a variety of chip manufacturers, but some of the older varieties from out of business suppliers are in great demand. Inlaid gambling chips (Crest and Seal-type) manufactured by the U.S. Playing Card Company are a favorite of collectors. Robert Eisenstadt has devoted a lifetime to collecting and cataloging old chips, and his web site features photos of his collection. Inlaid chips sell from just a few dollars to thousands for rare chips from favorite old Las Vegas casinos clubs like the Dunes, the Flamingo, and the Great Provider. Because the hobby has blossomed and new price guides like The Official US Casino Chip Price Guide (By James Campiglia and Steve Wells) have hit the market, collecting continues to be popular – and prices have risen to amazing levels. According to Anthony Curtis, the man behind the Las Vegas Advisor, a record price for a $1 denomination chip was realized after retiree Sandy Marbs listed a single chip on eBay that she found at the bottom of her jewelry box. I guess that $1 investment paid off pretty well. I hope I see many of you at this year’s convention and don’t forget, I’ll be doing a little PowerPoint presentation with lots of pictures from my book: The Roots of Reno. The lecture starts at 9:00 AM on Friday, June 25. See you there! Next door to Barney’s at Lake Tahoe was Harrah’s Sports Casino. I walked in and was surprised by how small it was. There were about a dozen chairs for a keno game, several TV’s by the bar, a craps game, and half-a-dozen blackjack tables. They had little yellow signs with $1 to $100 on them. Who the hell would bet $100 at blackjack? Come on, this place didn’t even have a poker room. What it did have, in plenty, was cocktail waitresses, each in little black and white striped shorts. They didn’t look like any ref’s I had ever seen before! Not that I noticed, I was looking for a poker game. When I looked some more, there still wasn’t a poker game, but the waitresses were still there. These apparently were a different species than at the Park Tahoe. These ladies all seemed to be about 5’2 with very short hair. They were in tennis shoes. I wasn’t interested in drinking and they weren’t interested in me, so I left. Across the driveway towards the state line, underneath a statue of a Pony Express rider, I found a set of carpeted stairs leading through a double set of glass doors into Harrah’s. The real casino, the big one. Really! Over 1000 slot machines, sixty table games, a high-rise hotel with rooms too expensive for me, and a poker room. Well, not so much a room as a roped-off area at the end of a pit with six tables. Excellent. I was experienced now, things would go better for me. Plus, I got a stack of chips from the podium guy and they were really cool. Better than the Park Tahoe. These were hard plastic with little brass inserts and Harrah’s name in the middle. The $5 chips were red, with just four inserts, but the same middle part, a little brass nameplate. I played two hands before I realized it wasn’t 7-stud, it was 6-card stud. Well, no problem, I thought. I’m a smart guy, I can play with one less card. Apparently, however, I may have been playing with one less brain cell than my opponents who were more than happy to rake my chips into their stacks. At least I didn’t smash my leg into the stupid drop-box this time, but I felt just as much pain as I limped away from the table. I headed towards the back of the casino, past the hotel elevators and the front desk, toward the light. Head for the light, I thought. This time I left with just one chip, and no, it wasn’t the $5. I hit the parking lot and looked around. There were a lot of cars. I could see way far away into the Park Tahoe’s parking lot, and somewhere in that lot was my car. A 1970 Mustang with a Boss 302 engine. I had just made my last $105 monthly payment on it. Now I had money for poker. Well, no, not really, but I was hooked. I walked back to my car and started it up. The double glass-pack mufflers thumped away, but my gold Mustang wouldn’t go toward Highway 50. It really wanted me to go back and play, so I spun a donut and drove the 200-yards back over to Harrah’s and went back along my previous route to the poker room. They were just putting up a poster that announced a low ball tournament: $11 buy-in. I could afford that. I found a snack bar with $1.95 sandwiches and 50-cent sodas and became refreshed, just like the sign said I would. Then I wandered around until the tournament started, spending a total of $1 in nickles that drained through the polished-silver Pace slot machines with the Bar-Bar-Bar jackpots and bouncing yellow Genie’s. I was assigned a seat and they handed out some old, obsolete Harrah’s chips. Most had been drilled, but the one-dollar chips were still nice. When we hit the first break in the tournament I was still alive, and they said we were going to “race for the one dollar chips,” but it was too late for mine. I had already pocketed the three I had left. At the final table they colored-up our chips again and broke out some white $100 chips – no drill holes, but I never got a chance to get one to my pocket because we had to let everybody know how many we had and besides, I was afraid I might not win if I took a whole $100. I didn’t win anyway, but I did get paid, and they also gave me a couple tickets to see the Captain and Tennille show in the South Shore Room. I didn’t have anybody to go with, so I gave them to the guy who came in third. I’m a nice guy. Who knew just one of those obsolete $100 chips would someday be worth more than the prize money I did win? The Park Tahoe, 1978, what an awesome location for a casino. The Park was around for a couple years before becoming Caesar’s Tahoe when management found they had no ability to run the property profitably. When I arrive, I didn’t care about the casino names or what they stood for. I was 19 and ready to play some poker. I had arrived after a 200-mile drive, eventually passing Harrah’s on Highway 50 at the state line. When I drove on past Barney’s I saw that the Park Tahoe was the last casino in the area, so I pulled back behind the casino and parked my car. I had been playing poker on a regular basis with my high school buddies and at the Pacheco Inn down the street from where I was supposed to be spending my first year of college at DVC, but not today. Today I was at the lake. I was free, poker was not. I came in the back of the casino and had to walk a long way past several shops before I got to the casino. It was huge. There were dozens of huge chandeliers and it was brighter inside than out. The carpeting was red and brown, but the slot machines sported belly-glass with a brown and yellow logo of the Park Tahoe. Lots of bronze and chrome. There was a long line of tellers that I learned was the main cage, and in front of that were several groups of tables with plush ropes around them. The Pit. Not for me. I saw a sign that said POKER and walked across the casino floor. There were several cocktail servers in mini-mini skirts. I may have stared. They all seemed to look the same: 25 years old with long hair and big, ah, smiles. I looked at the bar and the servers and made a left where there was a small polished-brass railing and headed up a ramp. When I got to a restaurant I figured I went the wrong way. I headed back down the ramp and stopped by the bar. The cocktail servers were all still there. In fact, they had multiplied. They were everywhere, a whole gaggle of them. There may have been some slot machines around too. It took me several minutes but I found the poker room. It was ten feet away from where I had started. I milled-around, trying to figure out what was going on. At the Pacheco Inn, the tables were small oblongs and everybody sat on stools, up high. These tables were huge, with plush, deep-green felt. I didn’t recognize the games at first, nobody was playing low ball. When I got up the courage I walked into the room and approached a guy behind a little podium. He said they had Hold’em and 7-stud. I didn’t know what the hell Hold’em was, so I said I wanted to play stud. He said, “Take the seat next to the dealer on table three, over there,” so off I went. The first thing I did was sit in one of the very nice, high-backed chairs. They were on rollers, and I pulled myself under the table and smashed my knee into a very sharp metal box. What the hell was that doing under the table? I was in pain! In Pacheco, the dealer took the “rake” out of each pot and put it in her tray. Sometimes dealers took a lot, sometimes they didn’t. I’m sure it was all fair and legal. At the Park Tahoe, they took up to $2 from any pot. Holy crap that seemed like a lot of money. It was just a $1-3 stud game with a 10-cent ante, but that $2 going into the sharp, knee-mangling box under the table really bugged me. I thought of the poker games my buddies and I played for nickel-dime-quarter stakes with no rake and rarely anybody losing more than $5, but those days were fading away. Now I was playing with the big boys, or at least I thought I was. And the big-boys knocked me down, beat me, and took all my candy. Fast. Damn Bullies. I was going to keep one of the cool $5 chips because I had never seen a chip with a coin in the middle, but now I didn’t have any left. I just had two of the gray $1 chips with a gold hot-stamp in the middle and a rim with cards and dice mashed into it. So I left. At the table I had been staring over the gold railing that circled the room and looking down a set of stairs to a little lobby and the street below – so I headed out that way and hit the street. Well, actually I hit an alley and then Barney’s casino. But I already knew from a conversation at the poker table that I should be going to Harrah’s where the poker games were “really good.” So off I went. Did things improve? A little. I started playing blackjack like a fool but survived. Poker got better for me over the next few days and life was good again. So were the lake views, the cocktail servers, and all the chips I collected. So, what exactly is the scoop here, you might ask? I would have to say that I have sold out. I’ve been busy, working a regular job and ignoring my blog, and my articles, and my books, and blah, blah, blah. Now if you want to know about Lake Tahoe, well, I’ve got nothing for you but this photo of me jumping out of the 62-degree water and back into the boat near Emerald Bay. Apparently, this is also the reaction many gamblers have had, as more and more (or fewer and fewer) casinos around the lake are getting by on less income. Table games are dwindling, and some properties like the Cal-Neva are all done! Makes me so sad. I’ll be at North Shore this summer – email if you want, perhaps we can run into each other somewhere. In the meantime, new posts will be coming your way quite often now that I have my life arranged a bit better and everything is awesome!